The combination results in a breed which unites the traits of two highly successful parent breeds. The Brahman, through rigorous natural selection, developed disease resistance, overall hardiness and outstanding maternal instincts. Angus are known for their superior carcass qualities. They are also extremely functional females which excel in both fertility and milking ability. A review of the development of the Brangus breed would take us back beyond the founding of the American Brangus Breeders Association in 1949; however, registered Brangus descend from the foundation animals recorded that year or registered Brahman and Angus cattle enrolled since then. Much of the early work in crossing Brahman and Angus cattle was done at the USDA Experiment Station in Jeanerette, Louisiana. During the same period, Clear Creek Ranch of Welch, Oklahoma and Grenada, Mississippi, Raymond Pope of Vinita, Oklahoma, the Essar Ranch of San Antonio, Texas, and a few individual breeders in other parts of the United States and Canada were also carrying on private experimental breeding programs. They were looking for a desirable beef-type animal that would retain the Brahman's natural ability to thrive under adverse conditions in combination with the excellent qualities for which the Angus are noted. The early breeders from 16 states and Canada met in Vinita, Oklahoma, on July 2, 1949, and organized the American Brangus Breeders Association. That organization was later renamed the International Brangus Breeders Association (IBBA), with headquarters in Kansas City, Missouri, and eventually San Antonio, Texas, where the permanent headquarters has been located since January, 1973. There are now members in nearly every state, Canada, Mexico, Australia, Central America, Argentina, and South Rhodesia in Africa. Registered Brangus must be 3/8 Brahman and 5/8 Angus, solid black and polled. Both sire and dam must be recorded with the International Brangus Breeders Association. Foundation Angus and Brahman cattle must be registered in their respective breed association prior to being enrolled with the IBBA. Intermediate crosses necessary to reach the 3/8 - 5/8 percentage are certified by the IBBA. Calves from Brangus were heavier at birth and weaning and for total pounds produced per cow. 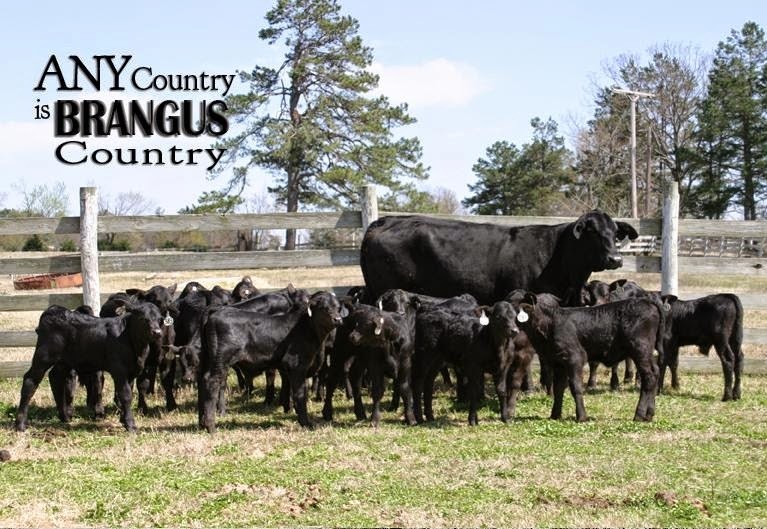 The Angus had an advantage in conception rate and calved earlier, and the calves were more vigorous at birth and survived better to weaning. The breed have proven resistant to heat and high humidity. Under conditions of cool and cold climate, they seem to produce enough hair for adequate protection. They are a hardy, disease and parasite resistant cattle that efficiently produce uniform, predictable calf crops. The outstanding maternal strengths, feedlot performance, and carcass merit of Brangus are advantageous to ranchers anywhere today -- especially during times of prolonged drought. This naturally polled, black hide breed was developed to withstand extreme climates and challenging environments. Brangus respond well to conditions of abundant feed, but they have shown a toughness to endure under conditions of stress. Just for the record, back in the 1950s, my grandfather starting running Brangus on his ranch in Hawaii for all of the same reasons others do today. Because they are hardy, disease and parasite resistant, have excellent weight retention and tolerance to heat, anywhere is Brangus country.